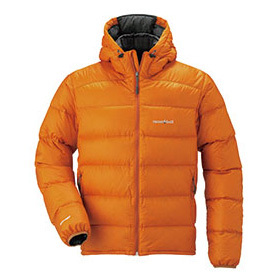 Cleaning down garments can optimize performance advantages and thermal properties, while helping to maintain its amazing warmth to weight ratio. If machine washing, wash on cold and gentle settings. Remember to always use a front-loading washer, as the agitator in a top-loading washer may damage the apparel. It is important to wash your items with a down specific soap. Never use liquid detergents or fabric softeners, as detergents may leave residues that will not rinse out and may wash away the natural oils of the down. MontBell recommends cleaning products made by ReVivex, available at your local specialty retailer. To dry your down apparel, place the items in the dryer and set the dryer for tumble dry on the lowest setting. Check the apparel often to make sure that nothing is overheating, and that the down is not clumping, if you detect the down is clumping, gently massage the item to redistribute the down. Please see our DWR maintenance section for more information about aftermarket DWR products. Please Note: If your care label indicates Dry Clean Only it may be incorrect. Please follow the online care instructions or contact customer service for more information. 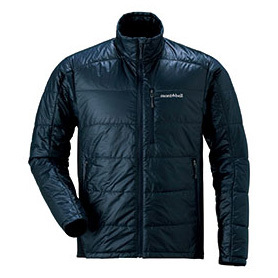 Regular cleaning of your synthetic insulated apparel will optimize its performance advantages and thermal properties. Wash on cold and gentle settings. Remember to always use a front-loading washer, as the agitator in a top-loading washer may damage the apparel. It is important to wash your items with a soap designed for synthetic insulation. Never use liquid detergents or fabric softeners, as detergents may leave residues that will not rinse out. MontBell recommends cleaning products made by ReVivex, available at your local specialty retailer. To dry, place the items in the dryer and set the dryer for tumble dry on the lowest setting. Check the apparel often to make sure that nothing is overheating. You can extend the life of your sleeping bag by storing it loose, in a cool and dry place. At the foot of each sleeping bag are two loops that allow you to hang the sleeping bag when not in use. All down bags also come with a large cotton bag for storage purposes. When washing your sleeping bag, be sure to turn the bag inside out, and zip up all of the zippers. If machine washing, wash on cold and gentle settings. Remember to always use a front-loading large capacity commercial washer, as the agitator in a top-loading washer may damage the sleeping bag. It is important to wash your sleeping bag with a down specific soap. Never use liquid detergents or fabric softeners, as detergents may leave residues that will not rinse out and may wash away the natural oils of the down. MontBell recommends cleaning products made by ReVivex, available at your local specialty retailer. When preparing to dry your sleeping bag, be very careful when moving it from the washer to the dryer. Lift the entire bag at once from the bottom and carefully place it in a large capacity commercial dryer. MontBell does not recommend using a home dryer as they can sometimes damage the bag. Tumble dry on low heat. Drying may take several hours, MontBell recommends checking the bag often to make sure it is not overheating and that the down is not clumping. If the down is clumping, redistribute the down with gentle massaging. It is also important not to line dry or expose your sleeping bag to direct sunlight for extended periods of time, as the UV rays may damage the nylon. 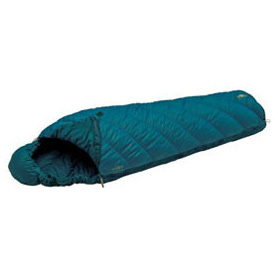 You can extend the life of your sleeping bag by storing it loose, in a cool and dry place. At the foot of each sleeping bag are two loops that allow you to hang the sleeping bag when not in use. When washing your sleeping bag, be sure to turn the bag inside out, and zip up all of the zippers. If machine washing, wash on cold and gentle settings. Remember to always use a front-loading large capacity commercial washer, as the agitator in a top-loading washer may damage the sleeping bag. It is important to wash your sleeping bag with a soap specifically designed for synthetic insulation. Never use liquid detergents or fabric softeners, as detergents may leave residues that will not rinse out. MontBell recommends cleaning products made by ReVivex, available at your local specialty retailer. When preparing to dry your sleeping bag, be very careful when moving it from the washer to the dryer. Lift the entire bag at once from the bottom and carefully place it in a large capacity commercial dryer. MontBell does not recommend using a home dryer as they can sometimes damage the bag. Tumble dry on low heat. Drying may take several hours, MontBell recommends checking the bag often to make sure it is not overheating. It is also important not to line dry or expose your sleeping bag to direct sunlight for extended periods of time, as the UV rays may damage the nylon. 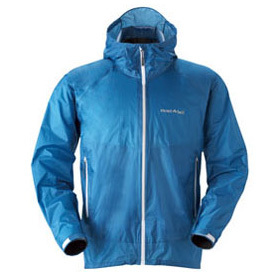 One of the key benefits of Hardshell garments is the ease of care. You can simply close all of the zippers and wash it with your other laundry using mild powder detergents. If available MontBell recommends front loading washers, as the agitator in a top-loading washer may damage your gear. MontBell recommends cleaning & DWR products made by ReVivex, available at your local specialty retailer. 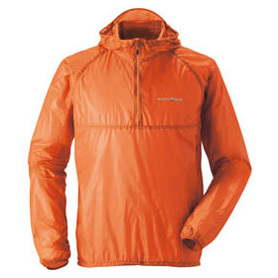 It is important to wash your Hardshell often because dirt and other contaminants will mask the "Durable Water Repellent" (DWR) finish and render it ineffective. Washing and drying helps to remove the mask and enhance the performance of the DWR. When washing, never use all hot water or all cold water. Always use a warm wash and a warm rinse, and be sure to run the entire wash load through a second rinse/spin cycle. This helps remove any residual detergents (which are surfactants or 'wetting agents'). The 'wetting agent' attracts water into the fiber, which allows the detergent to clean the dirt from the fibers. This is important to note because the DWR finish is trying to do the opposite, keep water from being absorbed by the fibers. All DWR treatments must be replenished from time to time. MontBell recommends spray on DWR treatments. Spray on DWR products are applied to the garment after washing and before drying, please follow all instructions. To dry your Hardshell place in a dryer on "low" heat, at the end of the drying cycle, you may increase the heat to "warm" and dry for an additional 15 minutes. Do not line-dry or air-dry your Hardshell. DWR finishes are heat activated and if the item is not exposed to "low" and/or "warm" heat for at least 45 minutes, then the DWR finish may not be restored. Heat is critical in bringing the DWR finish back to life. After drying is complete, remove the item at once; do not allow the garment to remain in the dryer, as burns may occur if the item sits on the hot metal of the dryer. If water is no longer beading up on your garment, it is time to replenish its DWR finish. You may use any of the widely available spray-on or wash-in treatments to restore the DWR finish to you shell. If your water resistant item has a micro-fleece liner or some kind of insulation, do not use a wash in DWR treatments. MontBell recommends ReVivex spray on DWR for most items. When washing, never use all hot water or all cold water on DWR shells. Always use a warm wash and a warm rinse, and be sure to run the entire wash load through a second rinse/spin cycle. This helps remove any residual detergents (which are surfactants or 'wetting agents'). The 'wetting agent' attracts water into the fiber, which allows the detergent to clean the dirt from the fibers. This is important to note because the DWR finish is trying to do the opposite, keep water from being absorbed by the fibers. Dry in dryer on "low" heat, at the end of the drying cycle, you may increase the heat to "warm" and dry for an additional 15 minutes. Do not line-dry or air-dry your DWR shell items. DWR finishes are heat activated and if the item is not exposed to "low" and/or "warm" heat for at least 45 minutes, then the DWR finish may not be restored. Heat is critical in bringing the DWR finish back to life. After drying is complete, remove the item at once; do not allow the garment to remain in the dryer, as burns may occur if the item sits on the hot metal of the dryer. You can extend the life of your tent with proper cleaning and storage. Before storing your tent, it is important to remove any loose dirt from the floor, and wipe the floor and fly with a sponge and water. Be sure that the tent is completely dry before storage, as any dampness will lead to mildew. If further washing is needed, please hand wash the tent in a mild, non-detergent soap and water solution. Do not use a washing machine, and do not soak the tent. 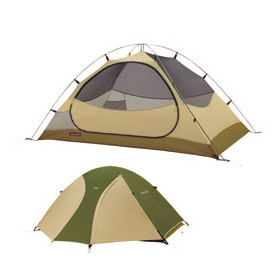 To dry the tent, please set up the tent and allow to air dry in a cool and dry location, out of direct sunlight. Do not place your tent in a drying machine. For Long-term storage, do not use the stuff sac. Instead, fold the tent loosely and store in a cool and dry location that is out of direct sunlight, as the UV rays in sunlight can damage the tent's nylon. Water is the best method to clean you backpack. Simply, rinse the dirt away with your hands or lightly scrub using a sponge and/or soft brush. If you believe that further washing is necessary, you may use mild detergent or pure soap. Do not use a washing machine, and do not soak the backpack. 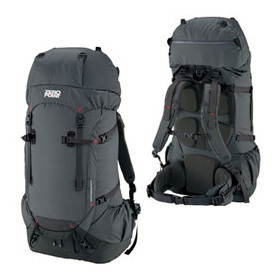 To dry the backpack, please hang the pack and allow to air dry in a cool and dry location, out of direct sunlight. Do not place your pack in a drying machine.